You can usually tell if your newborn puppies are feeding by carefully observing them over their first few days. Puppies who are getting enough milk will be generally quiet and will appear content. Hungry puppies will cry and may try to search for nourishment. Newborn puppies usually manage just fine when it's time to eat. The first milk that puppies get from their mother is called colostrum. This milk, rich in nutrients, contains antibodies that puppies need to protect them from diseases until their immune systems have developed. Newborn puppies should nurse within the first 12 to 24 hours to be sure that they get colostrum and that they are able to absorb it. Happy puppies are quiet puppies. Puppies who are getting enough to eat will generally be quiet most of the time and will act contented. If the puppies are not feeding, they will seem restless; they will spend a lot of time crying and moving around restlessly. It's normal for puppies to make some sounds, but typically newborn puppies make little noise unless they are distressed. A standard means of determining for certain whether or not newborn puppies are getting enough milk is to weigh them at least once a day. Write down the weight for each puppy. 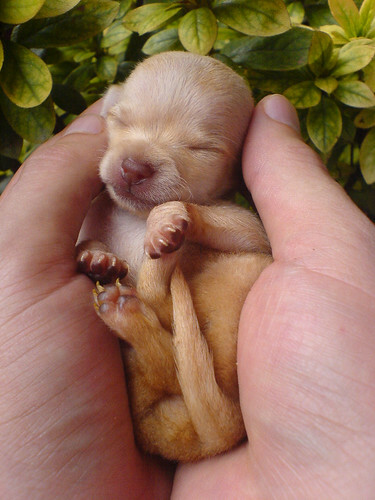 By the age of 1 week, each pup's weight should be at least double what it was at birth. Examine each puppy closely. A newborn puppy who's getting enough milk tends to look rounded and filled out through the belly. If a puppy is not getting enough to eat, his stomach area will look flat and may even look a bit pinched. A puppy who looks like he has an empty stomach may not be getting enough to eat. Motherless pups need warmth and sustenance. Keep them warm with a heating pad, heat lamp or hot water bottle. Give them warm canine milk replacer in a pet nursing bottle, and allow them to drink as much as they want at each feeding. Feed them every few hours for their first 2 weeks. After they eat, rub each pup's lower abdomen with a warm, damp cloth or gauze pad to help them empty their bowels and bladders. Newborn pups cannot do this for themselves and depend on their mother, or you, to help them out. If you must remove pups from a healthy mother, even part time, provide a source of warmth. You can express the mother's teats for milk or even for colostrum, if the dam is healthy, and then feed it to the puppies with a nursing bottle, a syringe or a dropper.